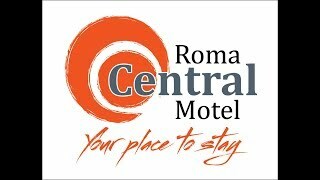 The brand new Roma Central Motel offers contemporary well-appointed accommodation. We are are centrally located and just a few minutes' walk to most facilities in Roma. Stay and relax in the comfort of Roma's newest Motel in acoustically designed rooms which have been built with your comfort in mind offering free high speed internet, free Wi-Fi, separate writing desk and insulated undercover parking with easy access to your room. They cater to the needs of travellers whatever your reason to stay in Roma. Room service including breakfast (cooked or continental) evening meals and charge-backs from the best local restaurant and pubs. Packed lunches also available. Licensed Premises with a "Smart Bar" located in Reception stocking a great selection of wines and beers plus a vast array of snacks. Call them today for a tailored package to suit your short or long-term requirements. They look forward to seeing you soon at Roma Central Motel. The brand new Roma Central Motel offers arguably Roma's premium motel rooms. They have been constructed with your comfort in mind, well appointed, spacious and acoustically designed to ensure a good night's sleep. Rooms include kitchenette with sink, microwave, toaster, kettle and fridge, complimentary tea, coffee, milk , sugar and gourmet biscuits, quiet reverse cycle air conditioning, dining table/writing desk (work station), sofa/tub chair, Foxtel, free broadband and Wi-Fi access, iPod dock/alarm, LCD television, premium linen, wardrobe, iron and ironing board, bathroom amenities and hairdryer. All their rooms are non-smoking.